$319/mo; $3499 due at signing, Limited 4×4, CCAP 36 Mo. The Jeep Grand Cherokee has always been a versatile vehicle; it is just as good as a comfortable daily cruiser as it is an off-road or high-performance machine. For the 2019 model year-at the tail end of the nameplate’s fourth production cycle-this midsize SUV now has blind spot monitoring and rear cross-traffic alert standard on all trims. Plus, one of the trims, the Sterling Edition, is replaced by the Upland. So, there are still 12 trims available, which are the Laredo, Laredo E, Upland, Altitude, Limited, Trailhawk, Limited X, Overland, High Altitude, Summit, SRT, and Trackhawk. Standard exterior features on the 2019 Jeep Grand Cherokee include automatic halogen quad headlights, LED taillamps, heated power side mirrors with manual fold-away ability, a liftgate-integrated spoiler, and fog lamps for penetrating illumination. Upper-level trims are more likely to have additional or enhanced features such as a bezel finish on the headlights, bi-xenon HID headlights, dual or quad exhaust tips, a power liftgate, power-folding ability on the side mirrors, chrome inserts on the grille, LEDs instead of halogen bulbs on the fog lights for brighter and longer-lasting illumination, a dual-pane panoramic sunroof, roof rails, automatic high-beam headlamp control for providing optimal light for night driving, and premium fog lights for even stronger illumination to cut through heavy fog and rain. The Laredo and Laredo E rides on 17-inch silver aluminum wheels; 18-inch ones go on the Limited and Trailhawk; and 20-inch ones are installed on the other trims. With two rows of seats to accommodate up to five people, the 2019 Jeep Grand Cherokee supplies a total interior volume of 140.5 cubic feet. Standard cargo space, which is measured between the rear seats and the liftgate, is 36.3 cubic feet. However, you can fold down the rear seats to expand it to 68.3 cubic feet. 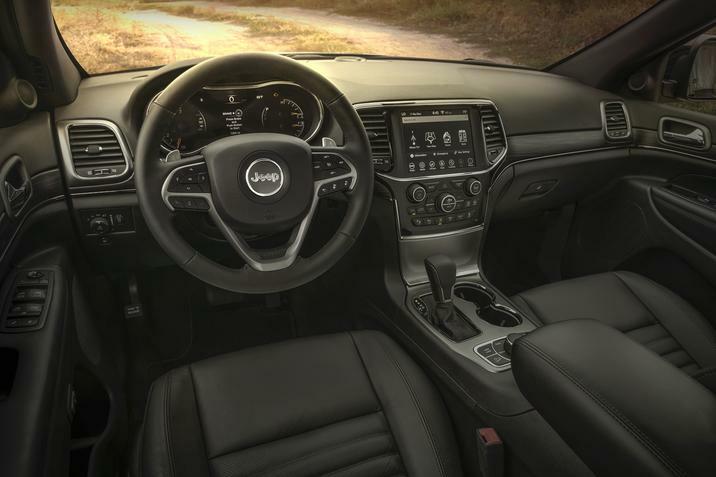 For comfort and convenience in the cabin, the Jeep Grand Cherokee starts with features such as cruise control, remote and proximity keyless entry, Bluetooth wireless technology for hands-free phone operation and audio streaming, a six-speaker audio system, two USB ports and an auxiliary audio jack for connecting mobile devices, smartphone integration via Android Auto and Apple CarPlay, a one-year complimentary SiriusXM satellite radio subscription, a memory card slot for playing additional digital media, and Uconnect 4 infotainment integration anchored by a 5-inch touchscreen interface. Upgrading in trim increases the chance of getting features such as leather upholstery, power-adjustable front seats with lumbar support, front-seat heating or ventilation, remote start, a 7-inch LCD instrument cluster display, a garage-door opener, an auto-dimming rearview mirror, nine speakers, a single-disc CD player, HD Radio technology, a rear DVD entertainment system, and 8.4-inch touchscreen navigation. For safety, the Grand Cherokee-in addition to the brand-new blind spot monitoring and rear cross-traffic alert-gets a rearview camera, electronic vehicle stability, all-wheel traction control, low-beam daytime running lamps (DRLs), rain brake support, an all-wheel anti-lock braking system, hill start assist, trailer sway damping, ready-alert braking, an accident response system. Restraint and cushioning in the event of a crash are provided by seven airbags, which consist of dual front impact airbags, a driver’s knee airbag, a pair of side impact airbags, and two side curtain airbags). Security is provided by an anti-theft system. Upper-level features include lane departure warning, hill descent control, LEDs on the DRLs instead of halogen bulbs, and a full-speed forward collision system. 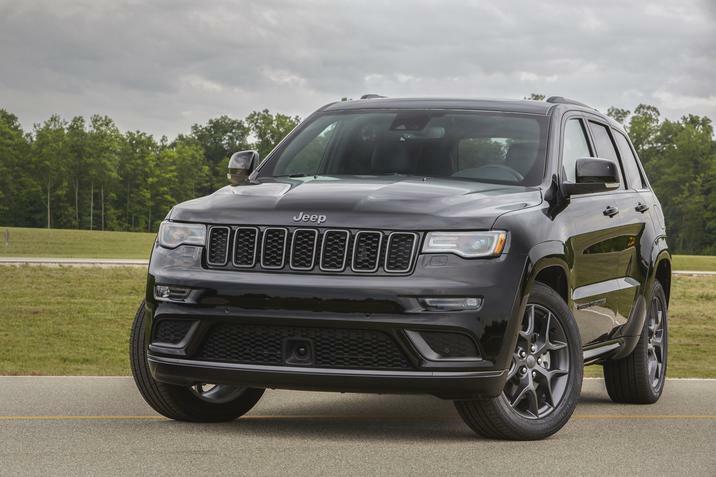 At the base level, the 2019 Grand Cherokee uses the long-running 3.6-liter Pentastar V6, which generates 295 horsepower and 260 lb-ft of torque and comes with a stop-start system to prevent unnecessary consumption of fuel. On the Limited, Trailhawk, Limited X, Overland, High Altitude, or Summit trim, you can swap the Pentastar V6 with the 5.7-liter HEMI V8, which generates 360 horsepower and 390 lb-ft of torque. Unique to the high-performance SRT is the 6.4-liter HEMI V8 engine, which puts out 475 horsepower and 470 lb-ft of torque. Also unique is the top-level Trackhawk, which is powered by the supercharged 6.2-liter HEMI V8 with 707 horsepower and 645 lb-ft of torque. All four engines are mated to an 8-speed automatic transmission; paddle shifters are added on the SRT trim for more convenient shifting of gears. Although you can choose between front-wheel and four-wheel drivetrains on most Grand Cherokee trims, the latter is standard on the Trailhawk®, SRT, and Trackhawk. Regardless of trim, the SUV gets a Select-Terrain system for providing all-weather capability in four modes: Auto, Snow, Sport, and Sand/Mud. 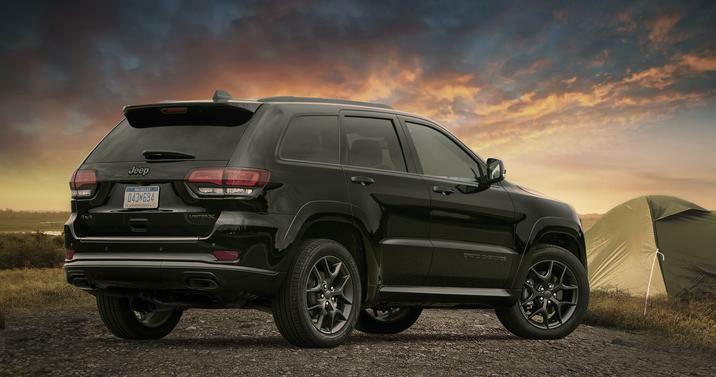 Ready for the 2019 Jeep Grand Cherokee in Antioch or Jeep specials and lease offers? Call us today at our dealership in Antioch Illinois. We serve residents near Chicago Waukegan Gurnee, and we are known for serving shoppers near Chicago Waukegan Gurnee with high-quality service and Jeep specials and lease offers, Contact us to schedule an appointment for a test drive of the 2019 Jeep Grand Cherokee in Antioch. One of our Jeep experts in Antioch Illinois will be available to help you get into the vehicle of your dreams.